Costa Rica, home to more than 910 species of birds (10% of the world birds) is also a hotspots for bird and nature photography. Most of the times we find in the social networks photos of birds taken by foreigner photographers which is great for the country, specially to encourage other photographers around the world to visit the “Pura Vida” land and capture amazing images of our birdlife. However in the country there is a lot of local talent, there are many “Ticos” that deserve the camera artist adjective, because of their talent on capturing the best of our amazing birds behind of their lenses. They spend many hours and lot of money to share with the world exquisite photos of the most bizarre and beautiful birds in the different regions of the country. There are many photographers in the country and all of the have a strong talent, but in the following list we are giving tribute to 15 of them as: – The Best Costa Rican Bird Photographers-, with the idea to highlight the great talent of the native photographers. 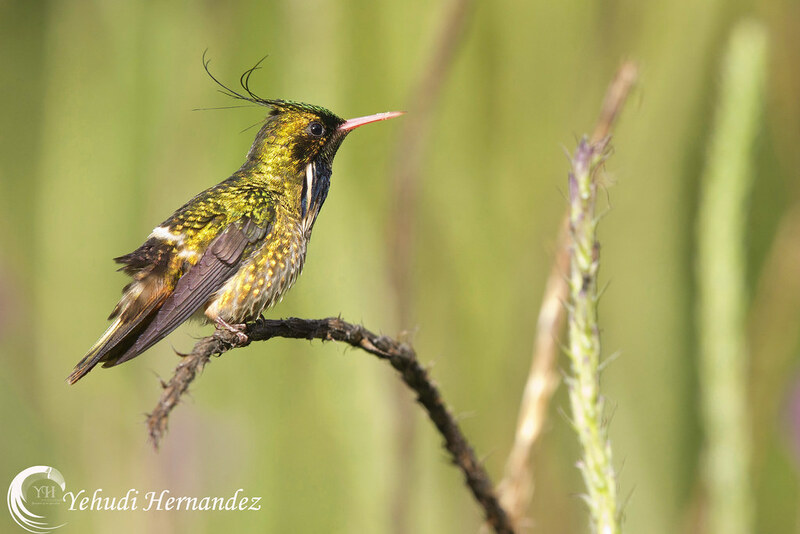 Native to Esparza Puntarenas, Alvaro is one of the most avid bird and nature photographers of the country. Alvaro is a tourist guide and also run his own photo safaris and workshops around Costa Rica. His work have been published by National Geographic in Latin America and other local and international, digital and printed magazines. Alvaro was a keynote speaker in the TEDxPuraVida 2016, he was finalist in the Smithsonian Magazine photo contest in 2015 and his work was recently added to the portfolio of the Most highlighted Photographers of the World by www.elfotografodenaturaleza.com, also have been awarded in many national and regional contests. 24 years old, Alvaro is the best example of the young talent on conservation, nature and bird photography of Costa Rica. A bird and nature lover native to the Escazu in San Jose, the capital of Costa Rica, Christian have been climbing steps in the bird photography world very fast, not only in the local market but also worldwide as a cosmopolitan traveler. His work is very special because of the quality and composition of the images. Christian´s bird shoots have been part of National Geographic Traveler Magazine in Europe and Latin America, the Birdwatching Magazine, Dream Travel Magazine, Revista Fotho and more. The Christian work exude passion and harmony making his pictures delightful to the eyes. 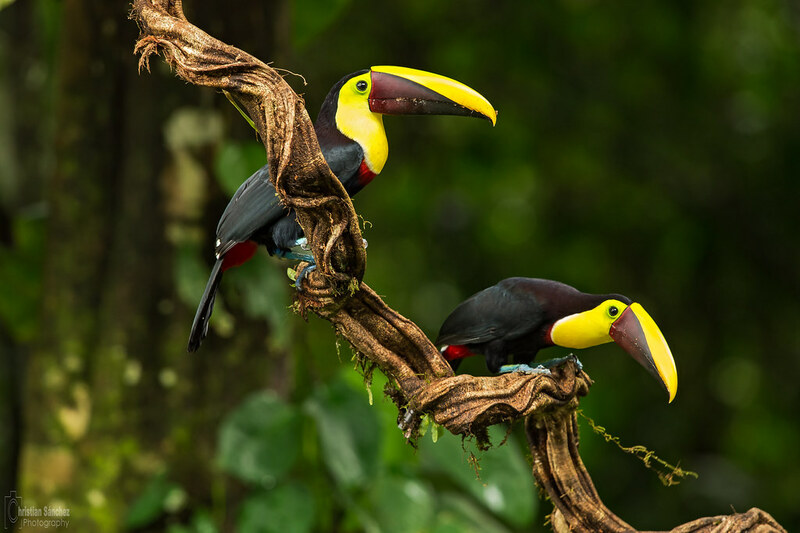 Yellow throated toucans in the Caribbean Lowlands by Christian. Discover his amazing photos by visiting his Flickr page. Born nearby San Jose in the countryside, surrounded nature helped him to develop a deep love for the birds, driving him to leave his career as an architect to become a birding guide in the 90s. In 2006 he touched by the first time a digital SLR camera opening the gate for a new passion mixing the birds love with nature photography. Now Juan Carlos is the author of some of the most dramatic pictures of birds and Costa Rica wildlife in their natural habitat. Vindas also runs his own company and is a tour leader on birdwatching photography workshops in Costa Rica and South America. Another “Tico” young talent is Daniel Hernández. Surrounded by the pristine forest of the South Pacific of Costa Rica Daniel learned about photography by reading books and because of his curiosity for the birds visiting his backyard. 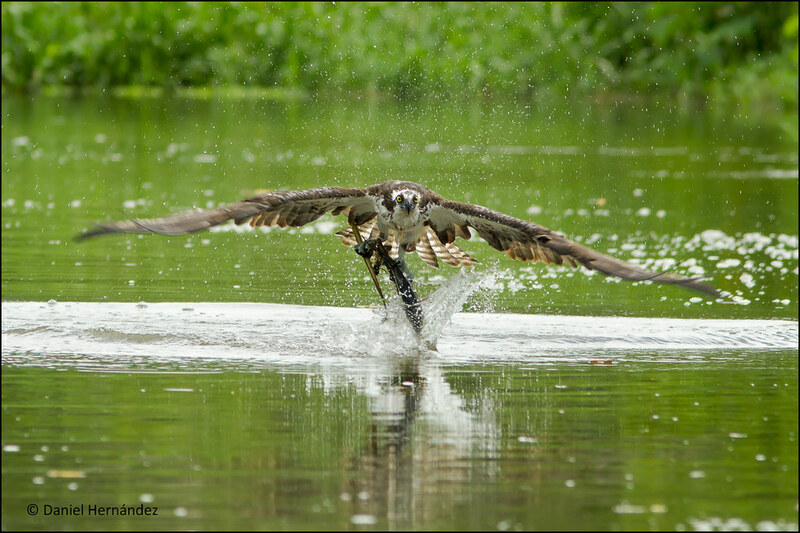 Daniel has an innate talent for the bird photography and his shoots have been awarded by Costa Rica´s Ornithologist Association in the 2015 photo contest and his work was published in the Jaguar Magazine of Mexico and some of the printed material of the Organization for Tropical Studies. Daniel is an student of Natural Resources Management and combine his career with the bird photography hobby. Osprey hunting in Daniel’s region. Visit his gallery in Flickr to explore his photography work. The 5th position is deserved by Edgar Mendez, another great Costa Rican with a strong passion for our feathered friends. Living in the Central Valle and running his own pet shop, Edgar spend a lot of his off time by traveling every corner of the country to make amazing photos of the natural behavior of birds. Edgar is the author of some of the best wild images of tanagers and euphonias, toucans as well. 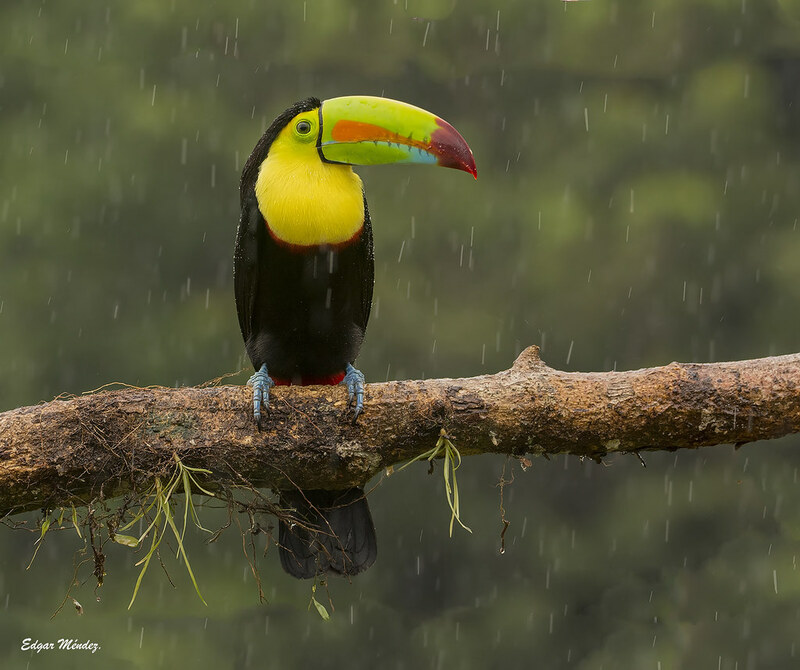 Keel billed toucan under the rain by Edgar Mendez in Costa Rica’s Northern Lowlands. Click on Edgar’s Flickr album and enjoy his collection of birds and nature images. Working as a banker we will find Raul wearing smoking in the city. But when is the field taking photos Raul will transform himself into a naturalist. His photo work is part of his free time hobby. We will find his images in some of the most popular social networks of Costa Rica and Latin America. Raul’s talent was discovered by himself while visiting the Costa Rica’s natural parks to escape the stress of the city. 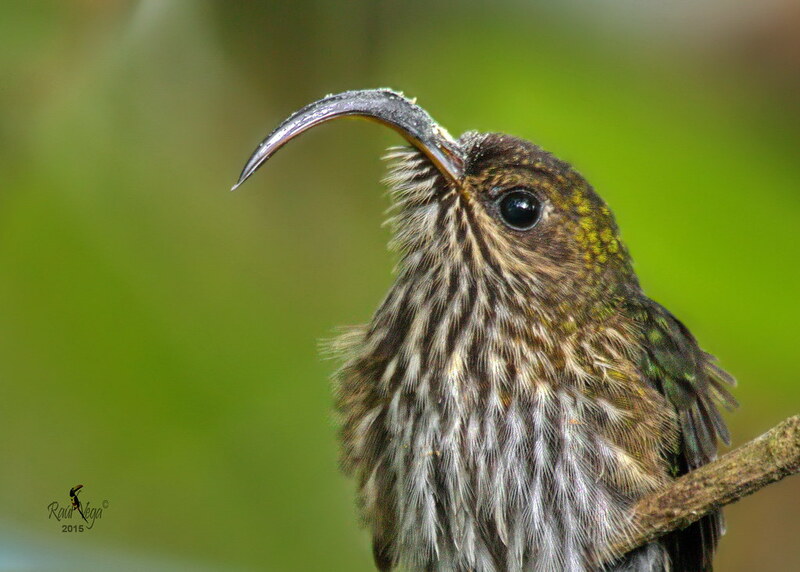 This White-tipped sicklebill is one of his great images. Visit Vega’s photos in Flickr. Known by his nickname “Jeff”, Jeffrey is a popular tourist guide and tour leader in the country. Jeffrey is the author of many natural history moments captured with his lenses, including feeding behavior of many bird species. Jeff currently is a leader and photo instructor at the National Geographic Sea Lion ship in Costa Rica and Panama, also he runs his own company Distinctive Expeditions. Male Passerini’s tanager with his chick. Visit www.distinctiveexpeditions.com to explore his photo galleries. Female talent under the camera is great in Costa Rica as well, and the best example is Joy Murillo a great girl in nature and bird photography. Joy started his career as a tourist guide and tourism student. Her work has been published in printed guides, local magazines and table books on Natural History of Costa Rica. Joy now is a professor of ecotourism in Monteverde and mix her love for nature with her photography skill to create gorgeous bird images. 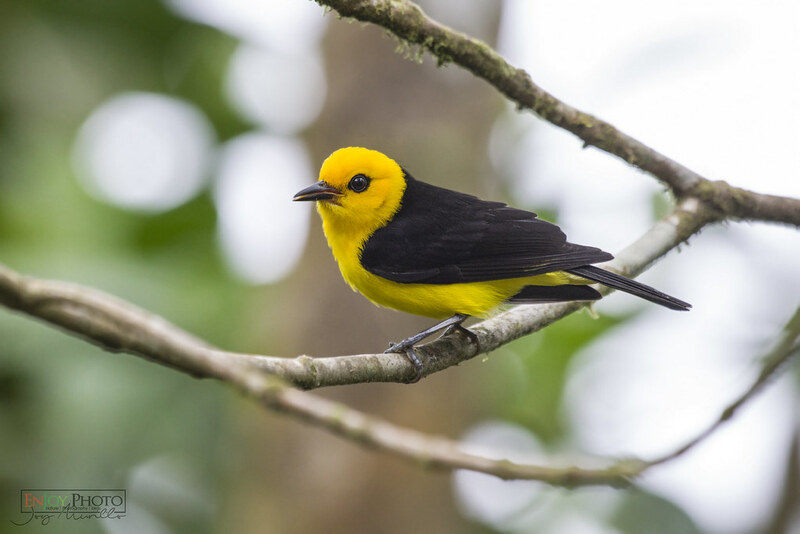 Black and yellow tanager in San Ramon, Alajuela by our favorite women on bird photography in Costa Rica. Her work can be found in Flickr. Born in Tibas, San Jose, Erick is a recognized architect, but while he is not building and designing he is having fun with his camera around Costa Rica. This passion let him to be honored by nature with “delicious” images of nature. His work have been published in material of the Costa Rica’s Ornithologist Association and popular photography social networks. 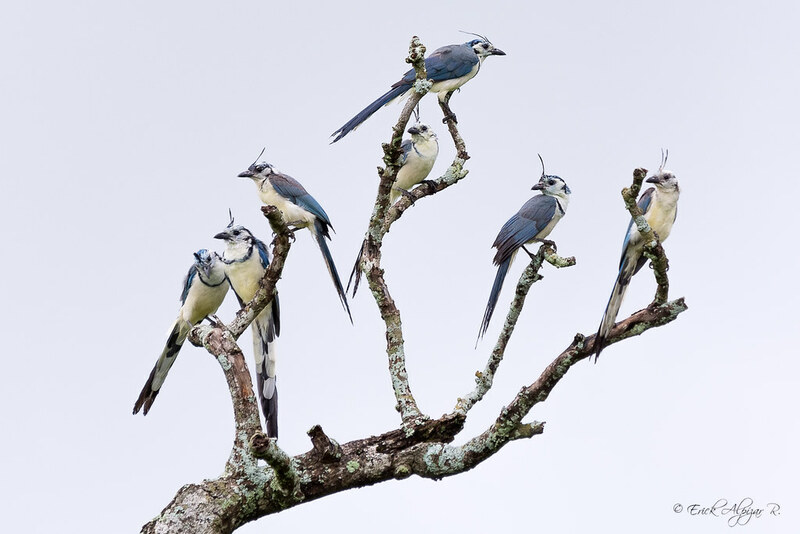 White-throated magpie-jays by Erick. His best photos are published in his Flickr profile. 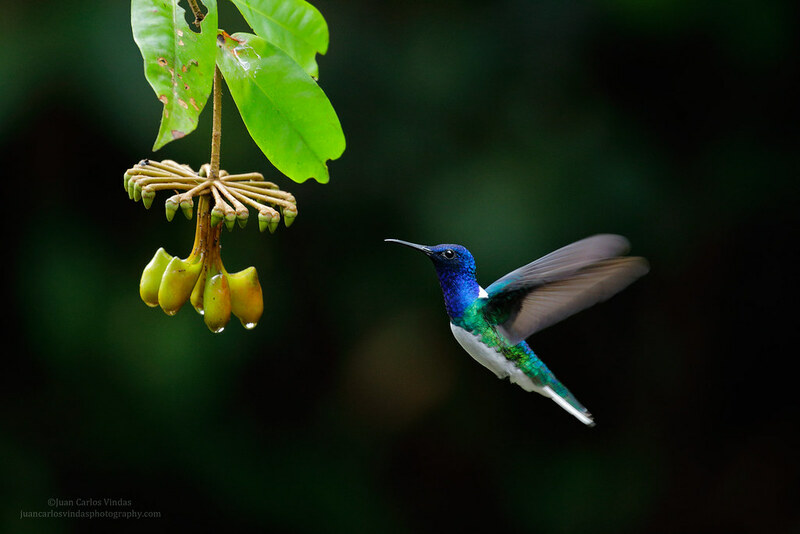 His work is very well known because of his popular bio-educational project Biofotos sharing images and data on the Costa Rica’a wildlife, including breathtaking photos of some of the most beautiful birdlife of the different eco-regions of Costa Rica. Chesnut headed oropendola by Bernardo. Bernardo always includes scientific information and data about the species in his photos to educate and share knowledge as par of his Biofotos project. Native to Sarapiqui, Yehudi is one of the great birding guides of the region. Working in the Sarapiqui area he develop his passion on natura photography leading groups of international companies. Since he speaks Italian is one of the most popular photo safari leaders for visitors from that country and his work is popular in Italian birds-nature photography Blogs. Black-crested coquette by Yehudi. His favorite photos are public in his Flickr photo album. Jose Lopez is a very well know guide-driver for bird and wildlife expeditions working with some of the greatest foreigner photographers during their visits to Costa Rica. Jose has strong skills with multi-flash photography, set ups and hummingbird photography. He is one of the most enthusiastic photographers of the country. Jose is great making photos of hummingbirds. Visit his wildlife gallery to learn more about his talent. Native to Orotina, Central Pacific of Costa Rica Alvaro was the winner of the 2015 photo contest of the Costa Rica’s Ornithologist Association. Alvaro is also a very young photographer with a great eye for the bird shoots. Gutierrez is very well known finding the track to photograph amazing raptors in Orotina and nearby. He is also recognized for his great charism and charming personality with other photographers. Alvaro’s photo of a Fiery-billed aracari feeding on the nest of other bird was the winner in the Costa Rica’s Ornithologist Association 2015 photo contest. Arnoldo was born in Golfito, South Pacific, but very young he moved to Atenas. He is an agronomist and business specialist. He started in bird photography three years ago and in that short time has recorded more than 650 of the birds of Costa Rica, including some of the most elusive and rare species. His work have been published in academic documents and books. Barred becard by Arnoldo Garcia, who have recorded in his photos many of the very rare birdlife to Costa Rica. Enrique Pacheco native to the Central Valley is the author of some of the very best photos showing the beauty of the common birds of the Central Valley including the Clay-colored thrush and the Rufous-collared sparrow. Rufous-collared sparrow feeding a chick by Enrique Pacheco.